The Electronic Torque Wrench is designed to have the bolt close to the point of stretching during the initial torque setting. The wrench features a 3/8 inch and ½ inch drive, three modes of operation, 2 percent torque accuracy, and 72-tooth gear with a 5-degree ratcheting arc. SPARKS, Md., Oct. 29, 2018 /PRNewswire/ -- More and more frequently, torque-to-yield bolts are being used in vehicle manufacturing. 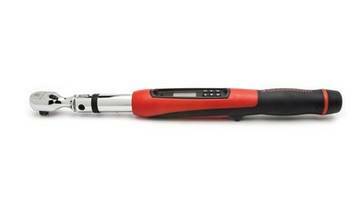 To help automotive techs handle those jobs with precision and confidence, Apex Tool Group is introducing its new GEARWRENCH® Electronic Torque Wrench with Angle. "Without a torque wrench with angle, the Technician might 'eyeball it,' use paint markings on the head bolts or use a torque wrench and angle gauge," said product manager Jim Stewart. "Our new Electronic Torque Wrenches with Angle allow technicians to do standard torque jobs and also jobs requiring angle using one tool. They're accurate, quick to set up, provide repeatability and are easy to use." The new GEARWRENCH Electronic Torque Wrench with Angle is available for 3/8-inch and 1/2-inch drives. It features three modes of operation: Peak Torque, Angle, and Peak Angle. Torque accuracy is 2% clockwise, and 3% counterclockwise in the 20-100% range. The 72-tooth gear provides a 5-degree ratcheting arc. An audible tone goes off as the Target Torque value is approached, and when the target torque is reached, the handle vibrates, a beep tone sounds and the screen display changes color—all to help ensure accuracy.